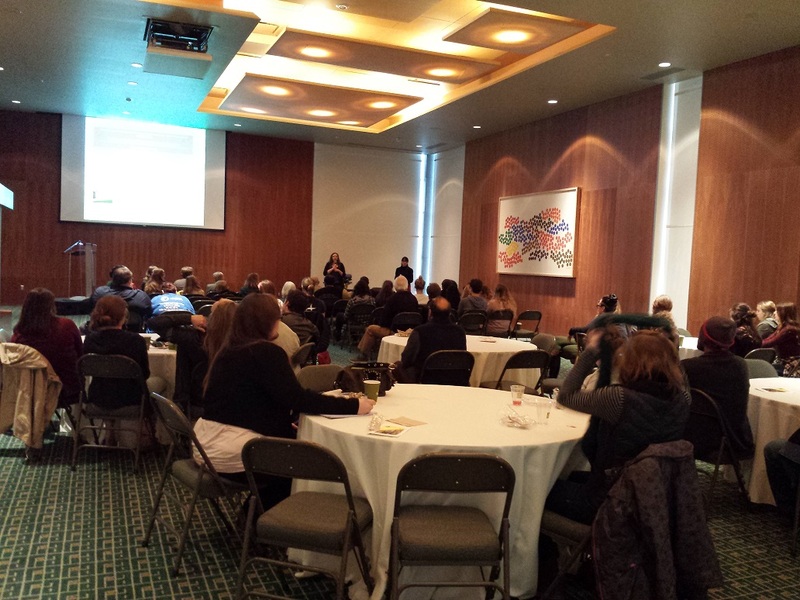 Students, faculty and public visitors came together at the Flint Institute of Arts on April 13th for an evening of scholarly presentations about Art History and Arts Administration. 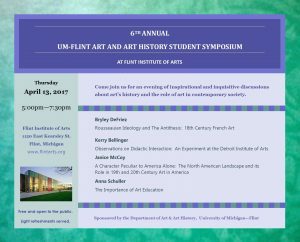 The goal of this symposium is to showcase student research and to generate public awareness about the rich art collection at the Flint Institute of Arts. The presenters were both undergraduate and graduate students who participated for the love of learning and to gain professional experience for graduate studies and their careers. The evening’s program consisted of four presentations, each offering quite different topics. The audience was given a chance to ask questions and our scholars shined with their poise and knowledgeable responses. This annual event has become a mainstay for student opportunities. In its 6th year, students answer a Call for Papers by submitting an abstract of their research. It may be a paper or project they have completed for a class or a new paper they may wish to research specifically for the symposium. If accepted as a presenter, the student receives support from faculty to refine their work and produce an accompanying powerpoint presentation. 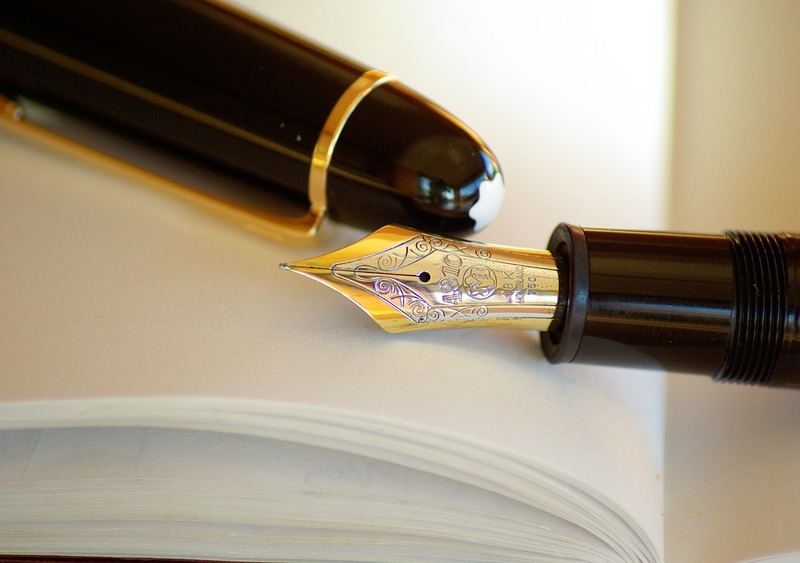 Conciseness is key when editing a research paper to work within a time-frame of 15 or 20 minutes, it’s hard work, but the experience is well worth it. 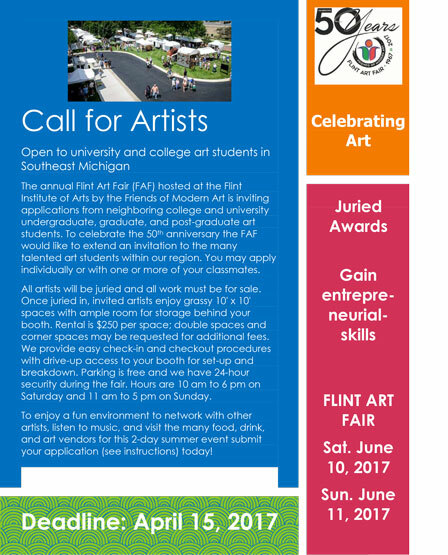 Opportunity: This is an application to participate in the Flint Art Fair at the Flint Institute of Arts on June 10‐11, 2017. As part of its 50th anniversary, undergraduate, graduate, and postgraduate university/college students from Southeast Michigan are invited to participate through a juried process. All artists will be juried and all work must be for sale. Display your work as an individual artist or in a student group presentation. Each year, the Flint Art Fair hosts thousands of visitors during this 2‐day event. Visitors enjoy live music, food and drinks, as well as getting to see over a hundred booths from professional artists. Judges will select award winners and prizes will be awarded Sunday morning. Instructions: To apply please provide the information below along with digital images of 4‐5 works of art representative of what will be for sale in your booth and send it electronically to Tracey Stewart at tstewart@flintarts.org by 11:59PM on April 15, 2017. Applicants will be notified of jury results and receive fair instructions via email on or before April 23, 2017. Responsibilities of artists: Once juried in, artists are responsible for set‐up and take down and should plan to attend the fair to be on hand to speak with visitors about their work. Students who participate in a group can arrange booth coverage amongst themselves. Costs: The registration fee has been waived. Booth fees are $250 per space; double spaces and corner spaces may be requested for additional fees. Booths are grassy 10′ x 10′ spaces with ample room for rear storage. Students may apply as individuals or as part of a group. However, please note that all artists are juried individually. Please provide a minimum of 4 images of different art works in jpeg format in high enough resolution to be projected on screen for jurying. For each image that you submit for jurying please provide the Title, Medium, Dimensions (framed/mounted as needed), and indicate if you will be selling signed reproductions of works. ECHO: Modern Reproductions of Contemporary Masterpieces. Students of ARH 411 present a Travelling Exhibition on the UM-Flint campus. 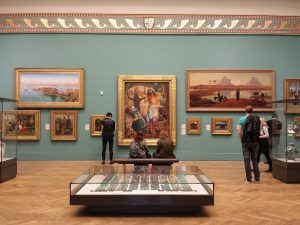 What are “Reproductions?” The art history students research chosen artists, not only to learn about an artist and their work in context, but also the techniques used by the original artist. The challenge is to re-create one work as closely as possible to the original. 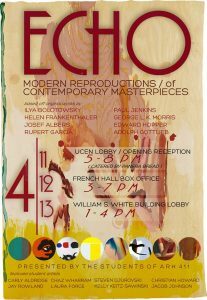 This exhibition of 8 artists’ works is curated by the class, some of which have never taken an art studio class and others who have learned new techniques to add to their own art work repertoire. for Free refreshments, to enjoy some art, learn something new! on Thursday, April 13th from 5-7:30. The event is free and open to the public. Light refreshments served. Presenters will talk about the history of landscape art in North America, the portrayal of women and gender in 18th-century France, the role of art in public education, and experiments in museum studies. This year’s presenters come from the MA in Arts Administration program, the Bachelor of Science in Art Education, as well as the Bachelor of Fine Arts in Fine Arts. For questions contact Dr. Lippert at sarlipp@umflint.edu. Going Abroad to attend a conference includes getting to see places related to its purpose. 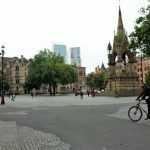 In this case, the 2016 Annual International Conference for Paragone Studies took place in Manchester, in the northwest part of England, said to be the world’s first industrial city. 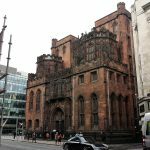 Activities included in the trip were planned to interest art historians, so of course on Excursion Day the participants were offered the option of accompanying us to visit John Rylands Library as our first stop. Just a short walking distance from our hotel, we set out in the city center. What I noticed and admired was the fact that people do much more walking here. Stopping at some of the corners in order to cross a street, words are written on the ground around the curve of the corner that say, “Look Left,” or, ”Look Right,” indicating the direction of potential oncoming one-way traffic. On the sidewalks next to many of the buildings were worn glass tiles from which you could discern light showing through to lower levels of the buildings. It added to the charm of the architecture that very closely resembled the Harry Potter movies. I was curious why a library was on our list of places to see among the art museums. It stood in stark contrast next to a very modern-looking building. It was charming, though it did not stand out to me among the various time periods represented in this cityscape. However, as soon as we stepped inside, I knew exactly why we were here. 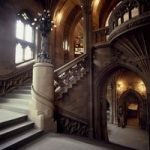 The John Rylands Library is said to be one of the finest libraries in the world and best example of neo-Gothic architecture in Europe. 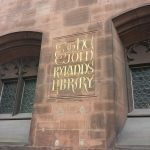 Taking ten years to build, according to the design by architect Basil Champneys (1842-1935), the library was a tribute by Mrs. Rylands to her late husband John Rylands who was Manchester’s first textile millionaire. 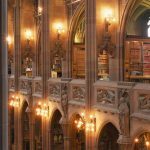 Although all of the bookshelves are encased under glass with Art-Nouveau locks, a style amidst the Victorian Gothic, this is very much a working library. 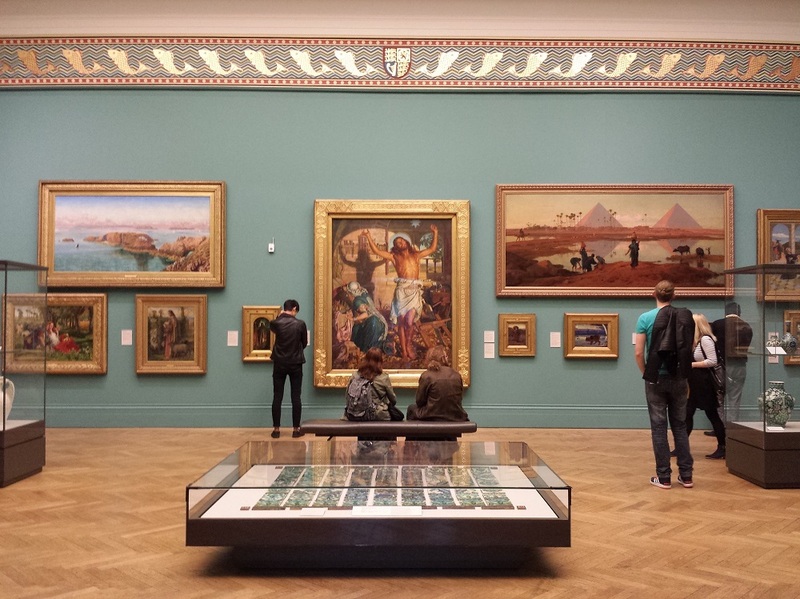 Researches from all over the world can easily gain access to the books and items in the collection that spans 5000 years from all corners of the world. One of the art historians from the conference, as a matter of fact, made use of the opportunity to stay behind during this stop on our excursion to see a book for research. I made a mental note for future reference that these professional scholars make use of all opportunities to research, view and photograph items relevant to their work, including during conference trips. Why not? 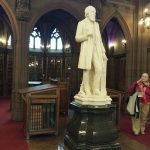 The original Entrance Hall contains a group of statues called, Theology directing the labours of Science and Art by Irish sculptor John Cassidy (1860-1939), who also created the sculptures of John Rylands himself overlooking the Historic Reading Room and Mrs. Rylands from the opposite end. 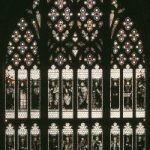 The stained glass windows and numerous sculptures aligning the reading room, draw from theology, literature, the arts and science, as a fitting tribute to those individuals who have contributed to human knowledge. Every inch of the building and its contents reflect the beauty of the period, well-known for its florid ornamentation. It was an exceptionally beautiful place for one to be immersed in the atmosphere of another time while researching from primary sources. After perusing the library, I gathered the conference participants and led them outside to meet our taxi’s for our next stop on this Excursion Day. I think now of why should this matter to the students at UM-Flint? Maybe the best way to put it is: Education Abroad makes things more real than you can get out of books or the internet. When you can actually see the scale of something surrounding you, when you can touch it, move through it and take it in as a whole…it begins to broaden possibilities. It’s time to start thinking about what you are studying and how you can gain experience from going abroad for a conference, or for an academic program. Yes, it enhances your studies, but it also allows you to experience another culture in the day-to-day and with this comes meeting new people. You are going to meet people who share your interests and passions, people beneficial to you professionally and people who may become lifelong friends. Go for it. 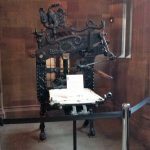 The John Rylands Library -Visitor Information, University of Manchester, Deansgate, Manchester, UK, 2016. 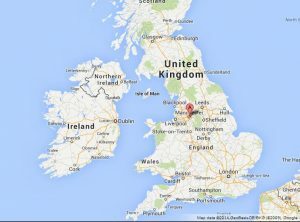 *Some images in this blogpost are designated from (c) 2016 The University of Manchester, all rights reserved. All others images are courtesy of the author. Coming Soon! 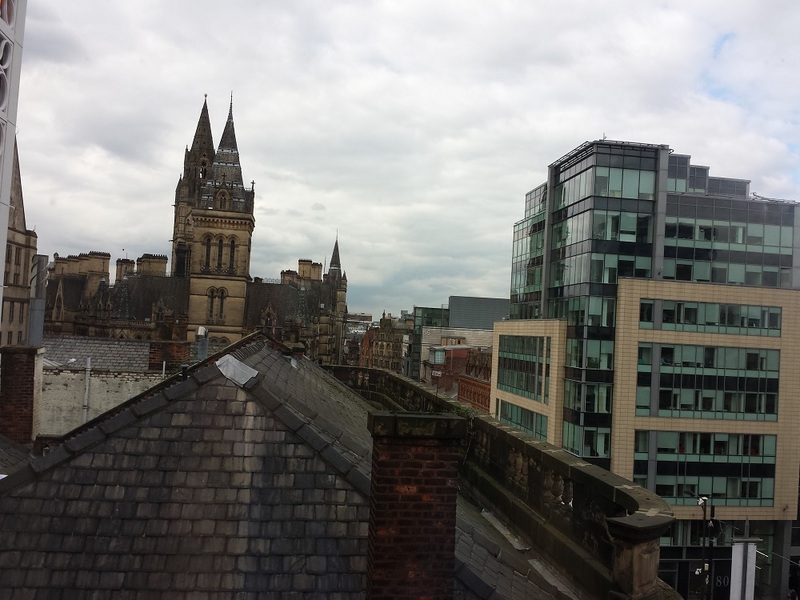 Next stop in the Conference Abroad Series- #3: The Monastery in Gorton. When going abroad for a scholarly conference, there are many things that can be gleaned from this amazing experience that feeds into one’s life, education and career. Whatever your reasons for thinking about travel to a faraway place for a conference, I assure you that you will return with much more than you initially considered. In this Conference Abroad Series, I will be sharing my experiences in hopes that you will seriously consider the advantages of traveling abroad at some point during your college career. 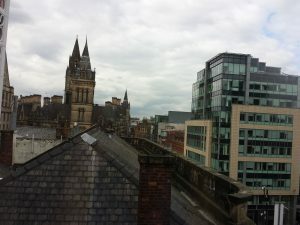 First, let me tell you a little bit about myself to give you some background into why I decided to go to Manchester, UK through an opportunity to participate in several ways at an Art History conference. 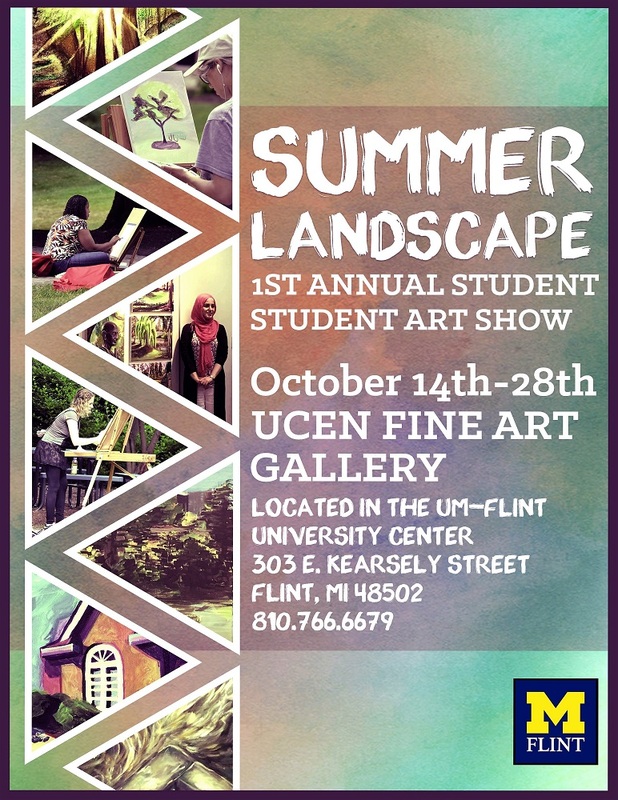 I came to UM-Flint to finish my art degree. However, as many transfer students know, universities require a certain number of credit hours to be taken ‘in residence’ at their school. Jumping through those hoops included taking more art history, something I had not enjoyed at other schools I had attended. From my course experience, I thought it was simply boring memorization. That is, until I took my first course at UM-Flint from Dr. Sarah Lippert. I had never taken a course like this before, full of information in regards to history, philosophy, politics, economics, science and much more, all as they relate to putting art in context for understanding the why-when-where-how of their creation and display. My eyes opened, and very wide, I might add. Her courses made me think much differently about art. They enabled me to communicate about it on levels I had never even considered before through writing and public speaking. As it turned out, it was not enough for me to simply complete my art degree, a BFA in Printmaking and Drawing, so I added a second degree in Art History and Criticism. I could not stop there. 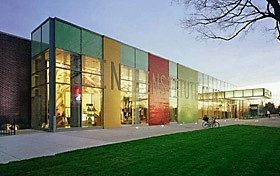 I am currently enrolled in the Arts Administration program to further my interest in museums, galleries and other spaces, and to learn ways to help other artists achieve their professional goals through entrepreneurship and working with arts organizations and events. All of this came about because of my eye-opening experience in the first art history class I took here. It changed me. So why did I decide to go to this conference? What difference would it make? Honestly, I almost decided not to go, but then I had a change of heart….my passport beckoned me to have a stamp from somewhere off this continent. So yes, that was a benefit, albeit a small one in the scheme of things. 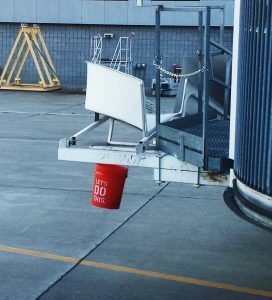 When it came down to it, I wanted to learn. Going to this conference meant that I would be participating in a variety of roles. The ideas that swirled in my head were about what I intended to learn about conducting a conference, as assistant to the director, about whether it would feel different participating as Chair to one of the sessions introducing professional scholars, and then presenting a paper along with them as a graduate student. 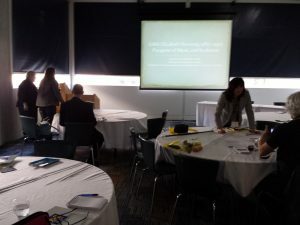 I thought about the places we would visit and what I hoped to see that would enhance my own academic program and at the same time inform the research that I am presenting to you in this blog. Little did I know. 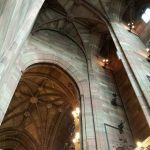 In this series of blog posts I will go more in depth, but let me just say that going abroad for a conference is much more than the ideas that swirled in my head as I watched the calendar until it was time to pack and head to the airport. It gave me so much more than I anticipated, and yes, it is much different than attending a conference locally or domestically. It’s better in so many ways that I will be telling you about. Until then, I urge you to check out every opportunity to go abroad while you are attending UM-Flint. Don’t let the finances scare you. There are a myriad of programs and opportunities available to fund your trip. Talk with faculty and visit the link and get started! Education Abroad Office at University of Michigan-Flint. “Let’s Do This,” my view while sitting on the plane, getting ready to leave Flint, Michigan to fly to Manchester, UK. 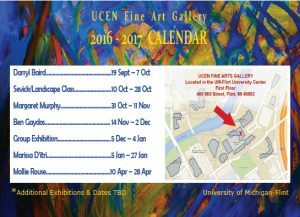 Summer Landscapes have never looked so good, as you will see when you visit the UCEN Fine Art Gallery October 14th – 28th. Mike Sevick’s class ventured outside this summer to capture the season and take their skills to a new level outside the typical studio classroom environment. For art students, it takes them out of their comfort-zone where they explore and experience painting in a changing environment, whether it be the wind, the sun or just sitting on the grass taking in nature. 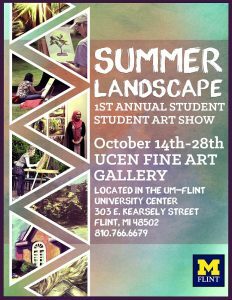 For non-art students, this is an exhibition where you can see the types of talent being honed in our Visual Art programs and hopefully it will entice you to try your hand at one of the many courses offered in art at UM-Flint. For more art, please visit our Facebook page UM-Flint Art News & Events. 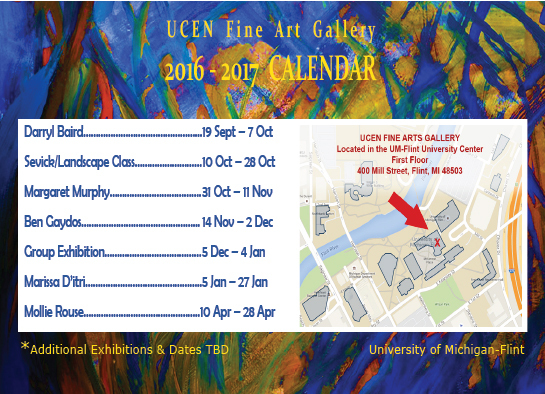 Here is the current lineup for the UCEN Fine Art Gallery at the University of Michigan-Flint. 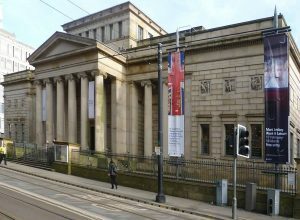 As additional exhibitions are added, we will be updating this Calendar to let you know what is happening at the Gallery. Please stop in and check out art work by faculty and student artists. 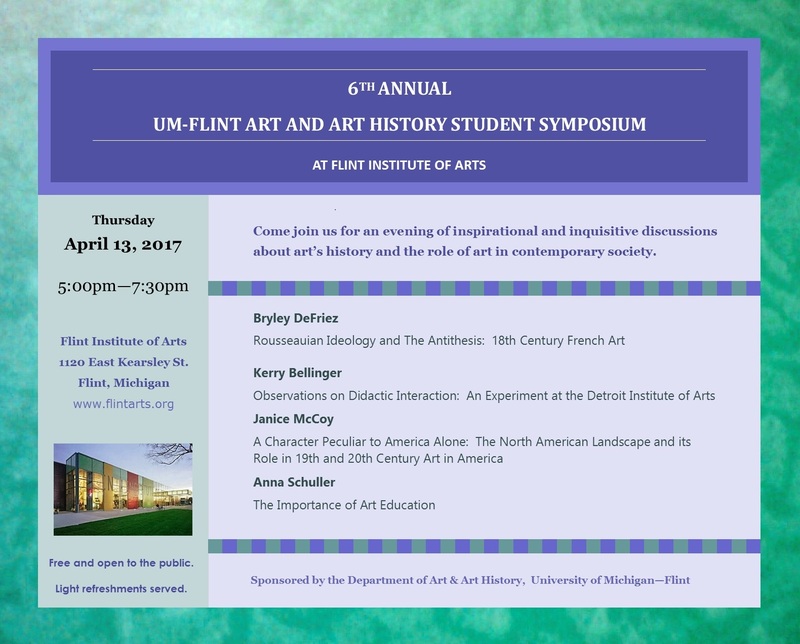 See what is being produced in our Art and Art History Programs, and visit us on Facebook for the latest UM-Flint Art News & Events, as well as interesting art-related topics, calls for art, and local exhibitions & events to visit! If you are interested in purchasing art, please visit our Fine Art Gallery page to view art and get contact information for our artists. To students who may or may not have considered participating in a conference, I highly recommend that they take this valuable step toward their future careers. UM-Flint has so many opportunities available to students to take advantage of that will set them apart and give them an edge. I recently had the opportunity to participate in a conference the week of September 19 – 25, with art historians from all over the United States, Poland, Switzerland, Italy, England and France, which took place at the Manchester Art Gallery in Manchester, UK. It was my first time traveling beyond our shores and honestly, it was not until an entire day had passed, after I returned home, that it occurred to me to look at the new stamp in my passport. 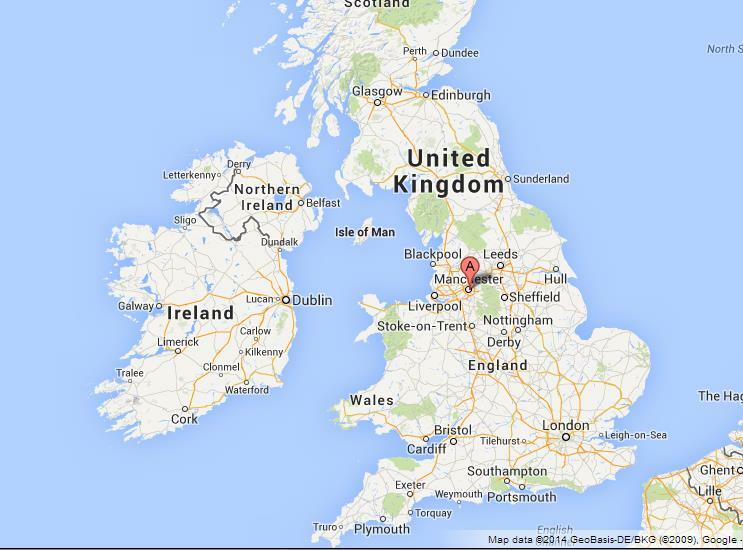 Although I can now say that I have been to England, I must point out that this was very much a ‘working’ trip. Attending a conference is not a vacation of sightseeing and leisure, it is a focused and purposeful trip that entails many functions that relate to my research, provides networking opportunities with fellow academics, and allowed me to not only hear new scholarship on various art historical topics, but to participate shoulder to shoulder on a professional level with scholars who excel in their field. Attending the 2016 Annual International Conference for the Paragone Society was a glimpse into the world of my future career, a prestigious entry for my resume and curriculum vitae, and a most valuable opportunity to examine art works in person. On a personal level, the experience gave me a chance to see how I ‘measure up’ at this point in my studies, to evaluate where I want to take my research, and what skills I wish to hone. 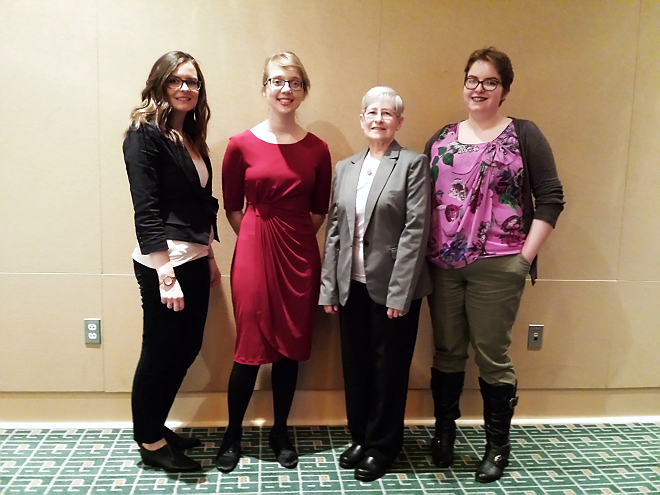 At the same time, working as an assistant to the Paragone Society’s director, Dr. Sarah Lippert, has given me behind-the-scenes experience in conducting a conference, a much more complicated endeavor than I would have imagined, had I not had this experience. In all, I would have to say that ‘The Conference Experience’ has reinforced to me that I have something unique to bring to the table. It has raised my level of confidence and shown me that I do indeed have a perspective, a background, and a voice to contribute. Are you considering participating in a conference? My advice: Just Do It. You will be glad you did. The annual conference examines the paragone, or rivalry in artistic practice and its related fields. All disciplines relevant to inter-arts rivalry are eligible to be featured, such as art history and visual culture, aesthetic theory, literary theory and comparative literature, philosophy, critical theory, visual communications, cultural studies, and musicology, amongst others. Rivalry from all eras of history and global contexts will be considered. Stay tuned for upcoming conference news on this blog!